Expand your Star Wars galaxy with Balance of the Force, the second deluxe expansion for Star Wars™: The Card Game! Its new rules, 154 cards, and multiplayer Death Star dial introduce two distinct multiplayer formats, two-versus-two team play and challenge decks. Challenge decks are powerful, self-contained, narrative-based decks of cards that introduce new, story-driven win conditions and allow a single player to challenge up to three opponents, simultaneously. Balance of the Force contains two complete challenge decks: Jerjerrod's Task and The Hunt for Skywalker. 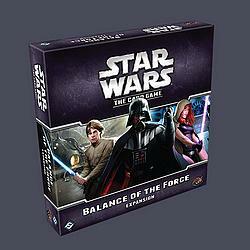 Additionally, Balance of the Force adds objective sets for each of the game’s six affiliations. These objective sets are legal for play in any format, multiplayer or head-to-head. In the game’s multiplayer formats, they promote rich teamwork. In head-to-head play, players can use them to enhance existing strategies and decks.